The crack in the window pane catches and splinters the sun, turns it into a rainbow halo, blue and yellow and red and green. Maya squeezes her eyes shut reflexively at the glitter, wincing at the pain it sends through her head. The glass she had forgotten to wash still sits on the old plywood packing case that serves as a combination side table and chest of drawers. The remnants of the orange juice and gin in it have trapped a couple of tiny insects; their corpses stick to the bottom like reproach. The air in the shack is already warm. It’s going to be another day of heat and sticky sweat, but Maya is used to that by now. Maya is used to almost anything. Rubbing her shoulder, which aches every morning from the hard bed and its thin mattress, she gets up. The wooden floor is rough to her bare feet, and she steps carefully before she finds her slippers. They’d had linoleum on the floor, but it had been old and cracked, and the cracked edges had become sharper and more of a danger than the threat of splinters. Walking over to the bucket by the door to splash water in her face and wash out her mouth, she finds that it’s already mostly empty. Sandeep has obviously been up earlier than her, and, as usual, not bothered to refill it from the hand pump behind the shack. By now he’ll be somewhere in the camp, looking for some hustle, maybe trying to scam some of the new arrivals out of their pathetic bundles of belongings. There are always new arrivals, and there will always be more. Maya’s head flares with ache, partly from the hangover, partly from irritation. She’s already overslept, and by the time she has gone to the tubewell there are already four other people ahead of her, plastic buckets and bottles lined up beside them. The one at the end, her neighbour Milan, looks over her shoulder. Maya doesn’t bother to answer. Milan is looking for a quarrel; Milan is always looking for a quarrel, and if she obliges the woman she’ll find herself alone. The rest of the neighbourhood detests her, Maya. They don’t mind Sandeep, who, after all, is a scrounger and grafter doing what he can to get by, just like they do. But she, they hate because she has some education and, even worse, because she has a real job. Most of them, like Milan, are from farming families who lost everything to drought, and have next to no usable education at all. Milan’s turn at the pump comes up, and she moves with deliberate and obnoxious slowness, so that Maya clenches her jaws together to keep from snapping. She feels an obscure sense of victory when the other woman finally moves away, but it’s already late and when she bends over the pump the water that comes up is a thin trickle, speckled with flecks and tinted a faint brown. They’re lucky to have this well at all. Most of the camp is supplied by water tankers and is rationed to two buckets per person per day, and even for that one has to pay. Maya doesn’t want to think about what’s going to happen when the well, inevitably, runs dry. When she gets back home, Sandeep is back, and already on the way out, chewing at a chapatti. It’s one of the two she’d kept for her own breakfast, and he starts guiltily when he sees her and tries to stuff the remnant into his pocket. Maya brushes past him without a word. There’s no time left even to be angry now. Anger wouldn’t do any good anyway. The scrap of solar panel on the roof of the shack has managed to fully charge the laptop battery. The tangle of wire and plastic that surrounds it takes up almost all the room on the little table, and when Maya pulls up the packing case and plonks a rolled up blanket on it to serve as a cushion, the headset falls off on to the wooden floor. This isn’t the first time this has happened, and she checks it quickly for any damage before slipping it over her head, the faceplate raised over her forehead until it’s needed. The headset is heavy and by the time she’s signed in, the sweat is already starting to slime her cheeks and the back of her neck. There isn’t anything she can do about it but try not to think about it, so she doesn’t. Today she’s lucky; she doesn’t have to wait long for an assignment. Usually there’s a wait that might stretch to hours, and several times she’s spent an entire day without being given a job. But not at this time of year. In this season, she will be needed. Her contact’s face appears on the screen, pale and expressionless over the blue and white Weather Services uniform. It’s too regular, too smooth-shaved, just a touch too handsome, so she’s sure that he’s really just a computer construct. Or maybe he’s just that good looking. She can’t tell. Maybe there are such handsome people on the other side of the planet, or wherever the hell he is. Does it matter? She’s never going to meet him in the flesh, anyway. Standard shift. She sighs to herself; it could easily last till dusk, and she can’t take a break, even for the toilet or to have a bite to eat. Still, the money will be good. She signifies her assent; a text file comes up, scrolling up the laptop screen just too fast to read, until the box at the end for her to tick. That’s her contract for today. Before she pulls the faceplate down, she takes one last look around the room, to make sure she hasn’t left anything burning or boiling, but then remembers that she hasn’t had time even to turn on the gas oven against the far wall. Then she notices that she hasn’t closed the door – while she’s working, it’s an invitation to thieves, or someone just out to wreck her things out of pure spite. Someone like Milan. She gets up quickly, draws it shut and slips home the bolt. If Sandeep comes back, he can just wait outside in the sun till she’s done. All day if necessary. Let him suffer; why should she put up with it? Back on the packing case chair, she pulls on the headrest and draws the opaque faceplate down. There’s the familiar brief shimmer and feeling of disorientation, and the darkness fades. The concrete glares white in the sun, so bright that the instant before the display dims the light sends a shaft of agony through her brain. The sky above is burnished steel, and she winces as though she can feel the glare beating down. Every time it’s the same, this instinctive wince, as she finds herself suddenly looking through the eyes of the machine, and then she feels herself flowing down its wires and circuits, merging herself into it. She isn’t a young woman with a hangover sitting on a packing case in a refugee camp, sweat crawling down her neck. She is this machine, and she makes it come alive. Her fingers move by the expertise of long practice on the controls. Motors hum and wheels begin to roll. When she was a little girl, Maya had wanted to be a pilot. They had lived in the hills then, up where they could look down on the valley with its towns and the little airport; and thrice a week the silver and grey-painted passenger planes with their whirling turboprops would fly low overhead and down, and Maya would drop her toys and her books and run to the big rock like an elephant’s head, at the edge of the escarpment, to watch them. But later she had overheard her mother complaining that her father was putting ideas in her head, and then her father had replied that it was just a phase and she would grow out of it. Only, she hadn’t. As she’d grown older she had become more determined than ever. The whispered conversations she’d begun to overhear had stopped being about whether she’d outgrow it and about how much pilot training might cost. There were educational loans, her father said. He would find out. He would make it happen. He was a government official, even if not a very important one. He would get it done. The first signs of trouble had started one day when Maya was fifteen, and one day her mother stopped her from going to school. There was rioting down in the valley, she said, and there might be a curfew. The next day there was a curfew, and the schools were closed. And two days after that her father had returned from the office, his face grim. “What do they want?” Maya had asked. “Maybe someone can do something about it,” Maya had replied, and gone back to her new book. It was by Richard Bach and all about flying. She couldn’t think of anything but it. But they hadn’t done anything, or not enough. The riots had spread, the rains had failed, and even though the army had intervened, things had kept getting worse. The schools were shut longer than they were open. Her father had grown thin and no longer talked of education loans for pilot training. There were no more books on flying. But there were often stones thrown at their house, smoke rising from the valley, and Maya did not go out to the rock anymore, because the planes had stopped coming. People began leaving. First it was only a trickle, the buses out of the valley crowded, their roofs piled high with luggage. Then the roads were suddenly clogged with vehicles – cars, pickups, lorries, everything – all leaving as fast as they could, which wasn’t very fast, and which became even slower on days when the army put up checkpoints to screen those who were leaving. “Where are they all going?” Maya had asked one day, looking down at the valley, which was hazy with vehicle smoke. “Are we leaving too?” Maya had asked in a small voice. “We can’t,” her mother had replied. “At least your father won’t leave. He still hopes things can be made better. If only I could...” Her jaw had shut with an audible snap. “What?” Maya had asked eventually. The roads had finally emptied out. Not because nobody wanted to get away any longer, but because the military was no longer allowing anyone to leave without exit permits. There weren’t enough to go around, no matter how many bribes found their way into the hands of officials who mattered. And they had run. They had run to get dressed. They had run to the car waiting down the road, where two strangers, a man and a woman, had looked at them with no welcome in their eyes. They had driven day and night until they had come south to this strange country, and the man and woman had stopped at a restaurant and asked them whether they’d wanted to use the bathroom. Maya and Sandeep had said yes. When they had come out, the car and the couple were nowhere to be seen. That had been three years ago. They had, of course, never managed to go back. Their parents had never contacted them, and Maya was afraid to find out why. They had found their way to the refugee camp. It was not the only refugee camp, and they weren’t the only refugees. Everyone was desperate, nobody had money or hope or anything else. Everyone was running. And then Weather Services had come offering jobs, for those who had enough education, of course. Skills? They could be taught. The pay wasn’t much, of course, not enough to let her leave the camp, nobody would ever pay that much – but it was reliable pay for honest work. Was she willing? What did they think, that there was a chance she wasn’t? She got a sprain in her neck nodding in her haste to agree. Through the drone’s electronic eyes, the world below is faded green and dun brown, the colours of dying grass and dried mud. Maya rises up from the base’s runway, a strip of concrete flung down like a scarf over red earth. Her flight takes her over the dirty little town that has grown up outside, a splash of brick and rusting metal and tattered plastic sheets, cars crawling slowly down unpaved streets. She banks over it on to her assigned heading, and lifts the robot’s nose towards the sky. Data fills her readouts: the drone’s parameters, fuel status, engine rpm and temperature, tyre pressure; the air temperature, which she already knows is too hot. The humidity, which is zero at the moment. And then it loads a topographical map of her assigned patrol area, down towards the hills to the south, where the winds off the distant plains will be lifting. With a turn of her head, she shifts from one camera to another, now looking over the long stretch of her left wing, the blue logo of Weather Services stencilled on the white. The drone is a crucifix soaring across the sky, like an albatross, or something older, like one of the great pterosaurs in the books she’d used to have. The pterosaurs are aeons gone now, and she wonders if there are still albatrosses left. Behind her are the whirling blades of the propellers, two spinning circles that cut the air, chew it to pieces, shred it, and throw it backward. The cameras can’t really give her a good glimpse of them or the tail, so she switches to the other wing, inspects it quickly, and then she’s looking front again. From up here the world is no longer such a huge place, the concerns of its denizens no more of such overwhelming importance. She still has a while to go to her patrol area, so for a little while she can relax. She still can’t get over how fortunate she is to get this job. It’s not flying a passenger plane like she used to dream of, but there aren’t many passenger planes flying nowadays anyway, and no longer that great a need for pilots to fly them. There aren’t many people except the very rich who are flying anymore, or those whose companies are paying. People like the executives for Weather Services, she supposed, if, that is, they need to travel at all from their luxury offices, wherever those are. She could have been watching over industrial robots or remote-driving a tractor at a GreenTech or Monsanto factory farm for wages less than this, and still have to consider herself lucky. There are plenty who would kill for a job like that. As, of course, there are those who would kill for her job, but that isn’t going to be available anytime soon. She has no idea who Weather Services has subcontracted her mission today to – GreenTech, probably – and how much they’ll be recompensed for it; but she is very, very good at what she’s paid to do. The earth below is rising towards the hills, the even flatness breaking into wrinkles and fissures. She passes over a dry watercourse littered with such enormous boulders that they look huge even from this altitude. Perhaps there’s still a trickle of water meandering between those great stones. A shadow catches her eye, a patch of dark green, off to the left of her path. Dark green is rare, and she has an impulse to divert course to fly over it, but can’t spare the time right now. She makes a mental note to check on the way back. Far away, from down south where the ocean which she has never seen lies, tons of water are drifting along with the wind towards her. As they meet the feet of the mountains, the rising air currents chill the moisture into towers of cloud, which will turn, eventually, to rain. Banking the drone smoothly to the right, Maya follows the line of mountains, looking for those clouds. She sees the first one on the horizon. It’s a monster, a pillar of grey and white connecting the dun earth to the metallic sky; white in the upper reaches but grey below, laden with condensed moisture and the shadow of the unshed rain above. It’s one of the biggest she’s seen in a long time, and as she turns on the video recorder for Weather Services she wonders if they might pay a bonus if she can finish the job by herself without calling for backup. Probably not, but it wouldn’t hurt to hope and sigh. The cloud is gigantic. It fills the forward cameras, looking almost solid, the bumps and folds of it like dimples on living rock. She puts the drone in a shallow dive towards its base, looking for a point where to begin. In a thinner spot halfway down the pillar, she finds it. Turning again, she flies into the cloud. The metallic sky fades and is gone. It’s almost dark before her now, murky like the bottom of a river, the tons of water above her sucking away the sunlight. She flinches, instinctively; she’s flinched every time she’s done this before, and maybe will every time she has to do this again. Her fingers move almost of their own volition on the controls, switching on the payload she carries under the drone’s wings. Laser-charged chisels of superheated air get to work, chipping and slicing. She’s a sculptor and a mason, now, cutting and shaping and wearing away the pillar, melting it before her as she goes. And then suddenly she’s out into the sunlight again, and the pillar of cloud behind her is ragged and sliced into two. Rising, she turns, finds another thin spot, and flies in again. By the time she’s finished, the great pillar of cloud is dead. Ragged fragments, refugees from the superheated blasts of air, are scattered here and there, already evaporating back to nothingness. There will be no rain from this one, not on this side of the mountains. Not on Weather Services’ watch, not on GreenTech’s territory. It really should be worth a bonus. They’ll be earning enough from it. On her way back to the base she remembers the patch of green that she’d seen on the way out and sets a course for it. It’s where she remembered, at the edge of the dried-up river, and she turns one of the cameras downwards for a closer look. The image jumps into focus. It’s sprawling, irregular, but too regularly irregular. Someone has tried to disguise it, but not done a very good job. Not to a drone’s eye view and an experienced operator who knows what she’s looking for. It’s an illegal farm. This is GreenTech territory; over to the west it’s Monsanto. Anything grown by anyone else is illegal, and whoever did this knows it, or they wouldn’t have been cultivating all the way out here, and they wouldn’t have tried to disguise it. As though in confirmation, the tiny figures of people appear, looking up at her. One of them has something in his hands, something long and dark. She sees the tiny spark of a flash. They’re shooting at her. Her lips pull back in a grimace. They can’t harm her at this range, but she won’t fly lower, in case they score a lucky hit. Pity, because she would have liked to be able to report exactly what they’re growing. Still, she consoles herself, as she steers the drone back on course for home, she’s going to get the bounty for turning in an illegal farm. Weather Services will take its cut, of course, but there will still be enough. Enough for a few bottles of orange juice and gin, at least. For the first time ever, there is now a unit for measuring patriotism! Definition: It is the level of patriotism achieved when an Amerikastani (or Brutish or other EUNATO) citizen randomly accuses a stranger online of being a "Russian bot" for the crime of disagreeing with his or her love of Hillary Clinton/hate (and ignorance) of Vladimir Putin and Russia/admiration of the so called state of Israel. Example: "Did you see this response column to this article saying Trump is betraying Israel by withdrawing troops from Syria? It's crawling with people who say that America had no right to send troops there in the first place! I called each one of them a Russian bot!" 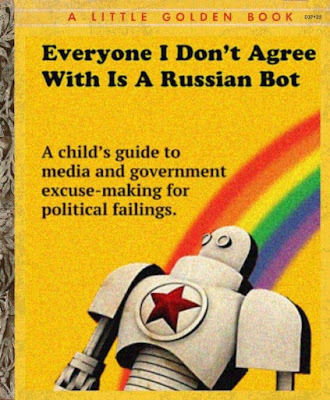 One Russianbot = 1000 millirussianbots. One millirussianbot being the level of patriotism achieved by insinuating that said stranger is a "Russian bot" without openly saying so, for instance, calling them "Ivan" or asking what the weather is like in Moscow. Patriotic physics and chemistry textbooks will soon be compelled to include this unit, if the authors responsible know what's good for them! I hate your freedoms. I'm evil that way. Absolutely not a nice man to know. Also, I eat your dreams. Dentist, writer, poet, cartoonist, hard left anti-imperialist commentator. Former liberal,now strongly anti-liberal. If you're not going to read me, read them! Could a Citizen's Assembly Solve the Israel/Palestine Conflict? Romeo Must Die: The Nanavati Case. Black Hawk Down: A study in racism, jingoism and propaganda. Subscribe To Me. I deserve it.